Knaresborough Town returned to the top of the NCEL Division One table courtesy of a comfortable 3-0 success on the road at Nostell Miners Welfare. Paul Stansfield’s men were briefly knocked off the summit following a midweek victory for fellow high-flyers Eccleshill United over Ollerton Town, but Saturday’s win means Boro are now two points clear. 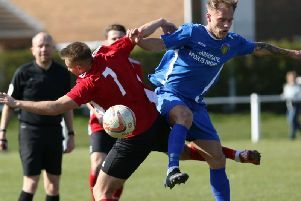 Nearest challengers Eccleshill went down at Glasshoughton Welfare, while third-placed Yorkshire Amateur could only draw with Hallam, leaving the Manse Lane outfit back in control of their own destiny and with a game in hand on both of their rivals. Boro eased to their latest three points, but could have won by a more handsome margin had their finishing been better on the day. The visitors had all the early pressure without creating a clear chance, but went ahead in the 19th minute when Dom Wilson picked out Brad Walker with a forward pass. Walker found Dan Thirkell who played in Steve Bromley with a ball which narrowly evaded a defender’s out-stretched hand and allowed the Boro striker to ripple the net with a low shot. A route-one move almost provided the second as Jack Rushworth’s clearance was headed on by Bromley for Walker to force a good save from home custodian Liam Powell. Matthew Johnson then fired wide as Nostell made a rare move towards the Knaresborough goal, but play soon switched back to the other end as Bromley turned Walker’s cross past the post and then Thirkell headed wide from a Bromley centre. When Bromley was tripped inside the box in the 33rd minute, it was left to Thirkell to fire home from the spot for the second game in succession, but the score remained at 2-0 until the break as Walker shot wide, Matt Donnelly fired over the top and Wilson’s effort was thwarted by Powell. Will Lenehan rushed a strike over the bar early in the second period and Walker had two further efforts end up off-target, the second after a Thirkell cross left him well placed. Nostell’s Danny Edwards, on his debut, then fired narrowly wide with a fine strike from out on the left before Knaresborough substitutes Ben Cohen and Dan Clayton went close to adding to the total. Cohen was then tripped in the penalty area in the 85th minute and Thirkell again stepped forward to convert from 12 yards, wrapping up the points.